Facebook Groups vs. Facebook Pages - Which Is Best? My short answer is you need BOTH a Group and at least one Page. Each serves different purposes. Special interests, causes, masterminds, study groups, beta testers, book reader groups (e.g. long before you publish your book, build up a tribe of peeps interested in your subject, give them sample chapters, get feedback on the content and cover, request testimonials, etc). All group activities go out into the feeds: wall posts, posted items, discussion threads, photos uploaded, and videos uploaded. This provides tremendous viral visibility, as I call it. You’ll want to highly encourage your group members to interact with all the features. Groups tend to be more informal and based around interests, so you can create better “stickiness” (members keep coming back) especially with regular email messages (I recommend keeping email content short, concise and max 2-3 times per week though – otherwise people will leave your group). You can take advantage of any of the three different types of Groups for different purposes: Open (anyone can join), Closed (the group owner/admins have to approve all members), Secret (only the members and invitees know the group even exists). 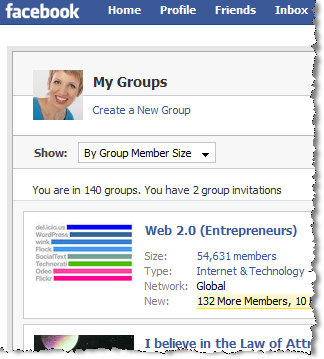 Groups are great ways to segment Facebook members and find your target demographic to expand your network. (I recommend participating in your top 2-3 favorite groups regularly, get to know some of the members and take some conversations private. Make friend requests when appropriate. Don’t go crazy with your links on other people’s groups). If you no longer want your group to be live, it can be tricky to delete. However, good news – you can migrate all Group members into your Page. See screenshot below, accessible on the Facebook Pages help area. SEO, SEO, SEO – did I say SEO? (Search Engine Optimization). lol. Seriously, your Facebook PAGE is specifically to represent your business and gets indexed by Google. In fact, Facebook recently released way more pages into the indexing system by allowing public search listings of member profiles to display a sampling of what Pages they are a fan of. What this means is that those people with Facebook Pages may see an additional increase in ranking. You can have multiple pages (possibly unlimited!) – great news for that SEO. For both Groups and Pages, you do have to manually track any and all activity. There is no app or feature in Facebook that will notify you when someone has commented on your Group or Page wall, posted a link/photo/video, added to the discussion board etc. If you know a Facebook app developer – there’s a big hole here for this type of notification app! You can create a Page using this form, or create a group here. 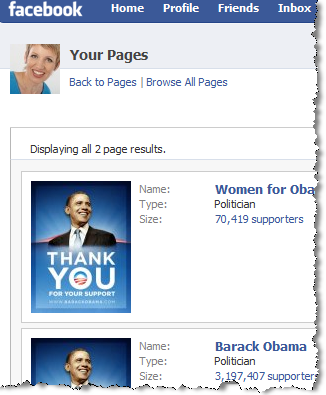 So there you have it – be sure to create BOTH your Group(s) and Page(s) for maximum visibility on Facebook! I’d love to know your experience and/or questions on Groups/Pages – please add your comment below. And if I missed any pros or cons, let me know!